Canoeing is a great recreational activity, allowing you to relax as you drift along slowly in the water. Perfect for all ages, canoeing proves a fun activity for nature-lovers and thrill-seekers alike. However, with so many canoes on the market to choose from, where should you start? If you’re planning on picking out a canoe to call your own soon, keep the following considerations in mind! 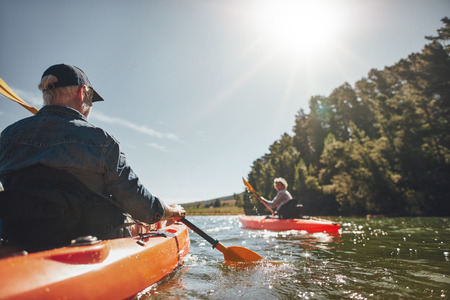 Lake or river paddling, tandem or solo rides, extended trips, portaging, fishing, hunting, whitewater playboating, and more: canoes serve a variety of purposes. When you first start searching for a canoe, take note of the many styles, sizes, designs, and materials. All canoes differ and work for specific activities, allowing you to find a canoe that fits your certain purpose. Determine first why you want a canoe and from there, start to hash out the features you desire! The length, width, and depth of a canoe impacts how the watercraft will function on the water. Longer canoes mean larger capacity and faster velocity. However, the longer design also decreases maneuverability in turning. In terms of width, the narrower a canoe is, the faster it tends to move, but with the less stability. No, we’re not talking about painting fire stripes along the side of your canoe (although, you would score some major points among fellow canoers). By design, we mean the elements that determine how your canoe handles on the water. Different elements influence the way your canoe moves, turns, and floats. Experience higher stability with the hull you choose and look to the canoe’s profile for flares that help resist tipping and tumblehomes that aid in stroke perfection. Once you pick out your canoe, plan a canoeing trip to Wabakimi Wilderness Park, Albany & Kopka Waterway Parks, or other surrounding areas through Mattice Lake Outfitters, offering great fishing opportunities and canoeing for the whole family. Give us a call at 1-800-411-0334 today!